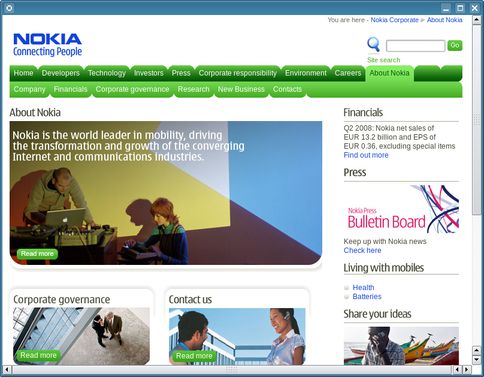 The image below shows QWebView previewed in Qt Designer with a Nokia website. See also Previewer Example, Web Browser, Form Extractor Example, Google Chat Example, and Fancy Browser Example. QPainter::TextAntialiasing and QPainter::SmoothPixmapTransform are enabled by default. See also findText(), selectionChanged(), and selectedText(). See also findText(), selectionChanged(), and selectedHtml(). Note: If the createWindow() method of the associated page is reimplemented, this method is not called, unless explicitly done so in the reimplementation. See also QWebPage::createWindow() and QWebPage::acceptNavigationRequest(). See also setUrl(), url(), urlChanged(), and QUrl::fromUserInput(). 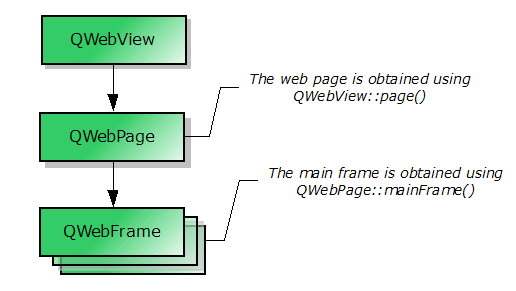 The parent QObject of the provided page remains the owner of the object. If the current page is a child of the web view, it will be deleted. Sets the value of the multiplier used to scale the text in a Web page to the factor specified. This signal is emitted when the status bar text is changed by the page. Returns the value of the multiplier used to scale the text in a Web page.